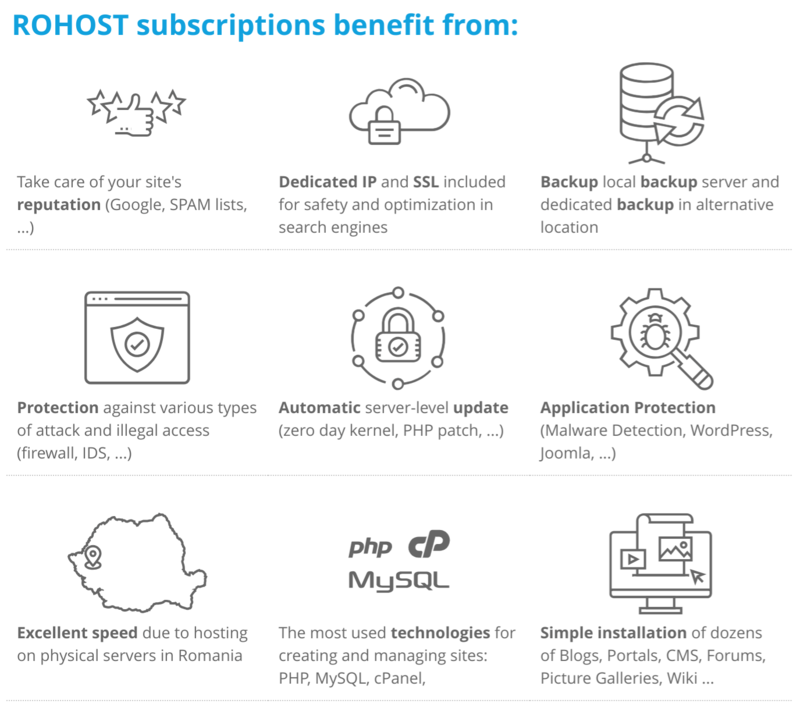 ROHOST Review 2019: Is ROHOST a Good Hosting? Romanian hosting provider ROHOST was established in 2000. The company has the expertise and infrastructure to provide web hosting solutions to small and medium-sized businesses in Romania and elsewhere. ROHOST is a web hosting company based in Romania. Established in 2000, this company provides web hosting and domain name registration services to small and medium-sized businesses in Romania and beyond. It has data centers in Timisoara, Romania, and is one of the top 20 largest hosting companies in the country. They also have a significant presence in Italy, Germany, France, and Switzerland, but their website is available only in Romanian. ROHOST’s data center benefits from several redundant fiber optic connections provided by some of the most respected companies in this space including UPC, RDS, and Euroweb. The vendor also peers with other internet providers like DomiNet. Their servers run on Intel Quad Core and Intel Xeon platforms, and Intel Core i7 single or dual CPUs. The storage medium is completely redundant RAID-1 or RAID-10 to prevent possible hardware malfunctions. For maximum reliability and performance, each individual disk goes through intensive testing for defects to eliminate any weaknesses. Local servers use SSD storage, are automatically updated to ensure they perform optimally at all times and are backed up to alternative locations to avoid any loss of data. Hosting solutions come with support for PHP, MySQL, and cPanel, with the cPanel allowing installation of dozens of portals, blogs, CMS, and forums. ROHOST’s hosting plan prices are relatively low compared with other Romanian vendors. They also have a free hosting package for programmers, web designers, and any websites supporting Romanian web development. Their billing cycles are monthly, biannual, annual, and biennial. This provider offers a 30-day unconditional warranty and guarantees service availability with their 99.9% uptime guarantee that is backed by a compensation plan. You can contact this vendor’s support team via their 24/7 voucher system (which is an emergency cases support platform) and the highly skilled technical team will respond promptly to all messages. They also have an email and ticketing system for clients’ non-emergency issues. Romanian customers can even visit their offices during business hours on Mondays through Fridays. The only negative is that ROHOST discontinued their telephone support because they found it to be ineffective and inefficient. There is also no live chat, and their knowledge base is quite sketchy. While ROHOST seems to be a serious player in the hosting business in Romania, the vendor is yet to invest resources in providing VPS and dedicated servers solutions. They also don’t have many options for users to choose from, essentially limiting their hosting customers to personal blogs and small businesses within Romania. Wondering how ROHOST stacks up against other Web Hosting companies? Enter any other Web Hosting company and we will give you a side-by-side comparison.